Have you ever noticed how when there’s child-sized furniture in a room, children always make a bee-line to it? Kids love pint-sized furniture and adults love stylish furniture, but it’s not too often the pint-sized and stylish worlds collide. 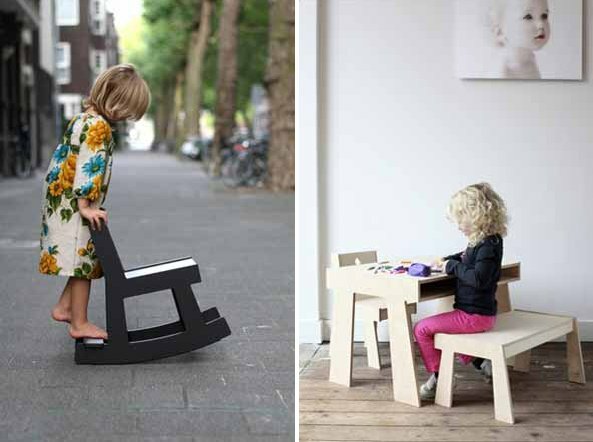 Dutch company Stek have a tiny furniture collection that covers the basics of stool, chair, bench seat, table and rocker. Don’t be fooled though, Babyology readers, there’s nothing else basic about these five pieces. Beautiful in their simplicity, the straight lines are gorgeously modern yet pleasingly childlike. Each is made from sturdy birch plywood and painted in a choice of colours or if you prefer the natural look, you can have that too! The bench seat and table are new to the Stek collection this year and feature handy storage space for children’s bits, bobs and treasures. The two pieces are available as a set or separately so you can mix and match as you please. The seat height is the same for all chairs so everything will mix and match perfectly. My favourite piece is the black rocker (pictured below), retailing at €219. If you wish to purchase, you will need a reshipper as Stek are not yet shipping to Australia.